Three further evidences commonly presented for the Cretaceous/Tertiary (K/T) boundary being the location of the Flood/post-Flood boundary are: (1) the Tertiary cooling trend, (2) Tertiary mammals of the western United States, and (3) Tertiary bird and mammal tracks and the Devils corkscrews. However, a close analysis of these suggests that they raise more questions than they answer, supporting the idea that the end of the Flood corresponds to the Late Cenozoic. 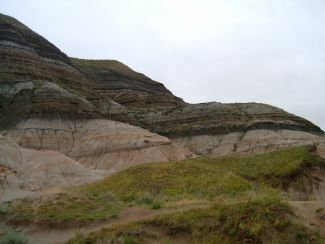 The K/T boundary exposed at Badlands near Alberta, Drumhella. I have developed eleven criteria with which to determine the boundary3 and I have about two dozen more to add—all saying the same thing: that the boundary is in the late Cenozoic. These criteria are based on an assortment of field studies, literature research, and geological deductions. Of the three main boundary positions proposed within the geological column, the Carboniferous boundary in the recolonization model4 has been analyzed and found to have many problems.5 The K/T boundary hypothesis, which states that the Flood/post-Flood boundary is at or a little above the Cretaceous/Tertiary boundary in the geological column, is much more popular than the Carboniferous boundary. How well is the K/T boundary model supported? Six main evidences are used to support the hypothesis and these are listed in table 1. In part 1, I analyzed the first main evidence used to justify this hypothesis, a change from global/continental to regional/local sedimentation and showed that it has many problems as a boundary defining criterion. In part 2 here, I will analyze the next three evidences that are sometimes claimed as support for the K/T boundary hypothesis. Those who support the K/T as the Flood/post-Flood boundary point to published paleoclimate reconstructions of a cooling trend during the Tertiary. They argue that such trends would not have occurred during the Flood but only afterwards. Figure 1. Inferred Tertiary cooling curve for the bottom of the ocean off Antarctica based on oxygen isotopes of benthic foraminifera from Deep Sea Drilling Project sites 277, 279, and 281 (drawn by Melanie Richard). What about the Tertiary cooling trend in the oceans? Since ocean-bottom sediments are mostly dated by microfossils, especially foraminifera, it is possible that the inferred temperature is too warm, since recent discoveries of foraminifera recrystallization have been reported.36-38 The recrystallization in question does not show up under a binocular microscope, and SEM analysis of these forams is not routine. Results suggest a temperature up to 15°C cooler for foraminifera that inhabit the surface water since recrystallization occurred deep in the ocean, which is much cooler than the surface. At present, we do not know how much of the Tertiary cooling trend is a result of misinterpreting foraminifera data. There is an element of circular reasoning in the oceanic and continental cooling trend during the Tertiary. This is because, if the date of the strata can be changed or is poorly known, geologists will sometimes date a Tertiary paleoflora or paleofauna based on its probable temperature preferences. For example, fossil plants in the western Sierra Nevada were at first dated as Pliocene in the late Tertiary (a cool period), but were later dated as early Tertiary based on the subtropical Chalk Bluffs fossil plants.42 This change in dates was obviously due to the warm climate aspect of the fossils. Given these constraints, how could post-Flood tropical and subtropical animals live in the interior of mid latitude continents and at high latitude after the Flood? 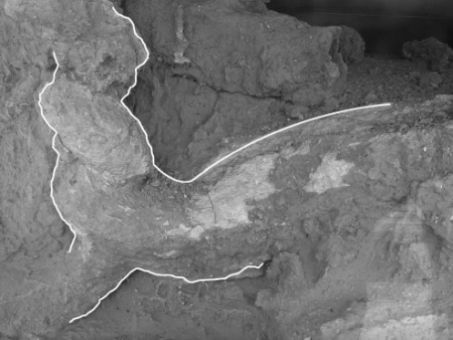 The circular reasoning in the dating of the Lyons fossil plants is evident. In summary, the climatic aspect of a fossil plant is used as a major criterion by which to date the fossil and hence the rock formation in the Tertiary. But if the rock is already ‘well dated’ a ‘short cool period’ is introduced into the warm early Tertiary and a ‘short warm period’ is introduced into the cooler late Tertiary. Then they turn around and teach us that the Tertiary was a time of cooling. There are many unknowns. One is the geography before and during the Flood. The assumption seems to be that it was largely similar to today’s in order to deny any refuge early in the Flood before death and fossilization. But the reality is that we do not know exactly what the region was like before the Flood or early in the Flood. The tremendous work of the Flood is the wild card. It is even possible that the present ocean basins may have been the pre-Flood continents and the current continents the pre-Flood oceans—a view espoused by the late Roy Holt and other creationists. There are multiple problems with the K/T argument that mammals in high intermountain basins and the High Plains were buried post-Flood. Another possibility to explain the mammal fossils would be the existence of high areas on the current continents during the first 150 days of the Flood until the Bible says that all the land was covered by water. Ongoing tectonics would cause rapid elevation changes of which we are not yet certain, resulting in land appearing as well as disappearing. Animals surviving in the water for a short time, possibly on vegetation mats, could then have disembarked onto these newly-emerged refuges, only to be killed and buried later in the Flood. The same problem exists in regard to Mesozoic dinosaurs. Proponents of the K/T Flood boundary assume that these terrestrial animals were buried late in the Flood, based on their acceptance of the geological time scale. (This view is a problem since the Mesozoic has billions of dinosaur tracks and millions of dinosaur eggs, which imply live dinosaurs that must have perished by Day 150.55,56 ) But this becomes a double standard. It is all right for dinosaurs to survive inundation for a period of time and not be buried until the ‘Mesozoic’, but the same explanation for mammals is not valid. Another logical difficulty presents itself to the K/T position. If mammalian fossils indicate post-Flood deposition, then where are the mammals that should have been buried in the Flood? It is true that more and more mammals are being documented in Mesozoic rocks, some quite complex,54 but the number of mammals is still relatively small. Thus, mammals are mostly missing from the Flood fossil record (according to the K/T boundary view). Most people would expect a substantial mammalian fossil record from the Flood and the ‘Tertiary’ provides it. This is another inconsistency in the K/T position: they find few mammals from the Flood, but find massive numbers from ‘post-Flood catastrophes’. Would these post-Flood processes have even had the ability to permineralize fossils like those in the Flood? The original proposition of Whitcomb and Morris in The Genesis Flood57—that mammals would flee to higher land during the early Flood catastrophe and hence would be buried later—remains both cogent and reasonable, especially given the same phenomenon observed in the Cayman Islands during Hurricane Ivan. An aerial survey of Grand Cayman revealed that the only sign of activity on the ground were animals congregated on higher ground.58 Similar behaviour would be expected from mammals at the onset of the Flood, making them the last group of animals to be buried and fossilized. Likewise, mammals may have lived at higher elevations than reptiles and amphibians before the Flood. Their warm-blooded nature and fur would have made them more suitable for higher altitudes—again, we are indebted to Whitcomb and Morris and others for the concept of ecological zonation. Table 2. Summary of evidence against mammals from the western United States being from the post-Flood period. 5. How are the Tertiary mammal changes to be explained? If we are to accept the chronology of the geological time scale, then K/T boundary advocates must be able to explain the order of ‘Tertiary’ mammal fossils. Why did the titanotheres, an extinct rhinoceros-like beast, live soon after the Flood only to be later replaced by other mammals? There are more odd-toed ungulates (hoofed mammals such as the horse, tapir, and rhinoceros), called perissodactyls, than even-toed ungulates (such as deer, bison, and antelope), called artiodactyls, in the early Tertiary.59 That trend is reversed in the late Tertiary. Why would we see such a temporal distribution of animals that existed at the same time after the Flood? More troubling is the variety of Ice Age mammals, such as woolly mammoth, ground sloth, etc., that are not found until late in the record. Another problem with the K/T boundary theory is the extent of extinction among mammals after the Flood. How would this happen at a time when mammals were filling the earth and migrating across continents to fill the various ecological niches? Why did the titanotheres become extinct right after the Flood, while woolly mammoths disappeared only hundreds of years after the Flood? I could multiply examples, but the point has been made. Localized post-Flood catastrophism must be able to explain the massive mammal extinctions around the world in the order of extinction inferred from the geological column, all within a few centuries after the Flood. These mammals were selectively spread across time in a manner not consistent with the post-Flood world. Finally, there is abundant positive evidence for the late Cenozoic Flood boundary (late Tertiary or early to mid Pleistocene). It is important to assess all the evidence, not select evidence that is appealing or familiar. 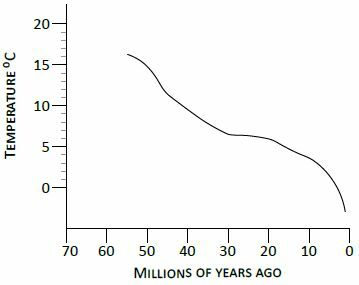 If the proponents of the K/T boundary model do not believe the evidence for a late Cenozoic boundary, it is up to them to refute the evidence that has been presented,3,34,40,60 but this has not been done. In conclusion, there are multiple problems with the K/T argument that mammals in high intermountain basins and the High Plains were buried post-Flood. These are summarized in table 2. Figure 2. Devil’s Corkscrew from Agate Fossil Beds National monument, western Nebraska, USA. Bird, reptile, amphibian, and mammal tracks are found in Tertiary sedimentary rocks in the western United States,61 such as the Eocene Green River Formation in Utah. Cat-like tracks are found in the Eocene Clarno Formation of central Oregon, and bird and mammal tracks are found in the Pliocene and Miocene of southeast California and northern Arizona. Tracks of birds and mammals are also found in the Tertiary of Europe.62 One of the most interesting ichnofossils of the Tertiary is the unique corkscrew-shaped burrows in Miocene sedimentary rocks in western Nebraska, called the “Devil’s Corkscrews” (figure 2).63,64 The discovery of beaver fossils in the burrows demonstrates their origin. It is argued that these features could not have formed during the Flood, so they must have formed post-Flood. Because of the highstand during the middle stages of the Flood, these ‘Tertiary’ tracks must be made either during the Flooding Stage (up through Day 150) or after the Flood—there are only two choices. Some features of the Ashfall site indicate a post-Flood environment, but other features indicate fossilization by the Flood. In addition to the eleven criteria, other criteria provided a preponderance of evidence for a Flood interpretation, including: (1) the amount of erosion in the area, (2) the presence of warm-climate animals, (3) the lack of typical Ice Age animals, and (4) the likelihood of the nearby Nebraska Sand Hills being early Flood deposits—Flooding Stage. This type of analysis can be applied to other Tertiary deposits. If it is true that these Tertiary deposits were actually formed early in the Flood, then it demonstrates a very important principle for diluvialists—that we cannot rely on uniformitarian dates or the location of geological units in the geological column for identifying Flood stages. Some creationists seem to forget that the Retreating Stage of the Flood, Days 150 to 371, would have been primarily an erosional event, especially in the rising terrain of the western United States (figure 3). With local exceptions, there is no reason to expect a strong depositional signature in that region (and others like it) after Day 150. In fact, Holt called the period the “Erodozoic”.73 Given the potential energy of the gradient and volume of water, this erosional event would have removed large parts of sedimentary rocks deposited in the Flooding Stage of the Flood (figure 3). Figure 3. 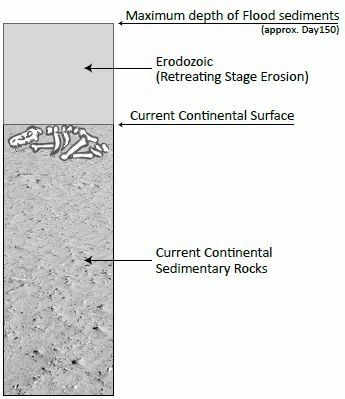 A simple block diagram showing the current continental sedimentary rocks with the volume of sediments eroded after Day 150, the ‘Erodozoic’, during the Retreating Stage of the Flood (drawn by Melanie Richard). The K/T boundary has been considered a logical location for the post-Flood boundary. Six lines of evidence have been suggested to support that position, three of which have been analyzed in this paper. The Tertiary cooling trend is subjective, and largely based on uniformitarian paleoclimatological assumptions, which advocates of the K/T as the post-Flood boundary are happy to question for ‘older’ strata, but not for the Tertiary. The abundance and diversity of mammal fossils in the Tertiary, and lack thereof in ‘older’ strata, suggests the Tertiary is the majority of the mammal fossil record from the Flood. Mammal and bird ichnofossils in the Tertiary mirror Mesozoic dinosaur tracks, and are likely made on BEDS (briefly exposed diluvial sediments) during the Flood, similar to the dinosaur tracks. Placing so many fossils post-Flood, as K/T advocates do, relies too heavily on dubious uniformitarian assumptions (which they throw out in reference to “older” strata) and ignores the most obvious solution within a biblical Flood model for the origin for so many fossils. Two final evidences suggested for the K/T boundary hypothesis will be analyzed in part 3. I thank Dr John Reed for reviewing an earlier manuscript and offering many helpful suggestions. I also thank Mrs Melanie Richard for drawing figure 1 and 3. Oard, M.J., Is the K/T boundary the Flood/post-Flood boundary?—part 1: introduction and the scale of sedimentary rocks, JofC 24(2):95–104, 2010. Return to text. Oard, M.J., Defining the Flood/post-Flood boundary in sedimentary rocks, Journal of Creation 21(1):98–110, 2007. Return to text. Tyler, D. J., Recolonization and the Mabbul; in: Reed, J.K. and Oard M.J. (Eds. 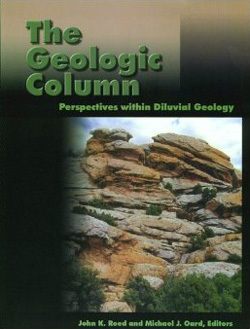 ), The Geological Column: Perspectives within Diluvial Geology, Creation Research Society Books, Chino Valley, Arizona, pp. 73–86, 2006. Return to text. Reed, J.K., Kulikovsky, A.S. and Oard, M.J., Can recolonization explain the rock record? CRSQ 46(1):27–39, 2009.Return to text. Oard, M.J., The Frozen Record: Examining the Ice Core History of the Greenland and Antarctic Ice Sheets, Institute for Creation Research, Dallas, TX, 2005. Return to text. Oard, M.J., Mid and high latitude flora deposited in the Genesis Flood—part I: uniformitarian paradox, CRSQ 32(2):107–115, 1995. Return to text. Oard, M.J., Cold oxygen isotope values add to the mystery of warm climate wood in NE Canada, JofC 17(1):3–5, 2003. Return to text. Christie, R.L. and McMillan, N.J. (Eds. ), Tertiary fossil forest of the Geodetic Hills, Axel Heiberg Island, Arctic Archipelago, Geological Survey of Canada Bulletin 403, Geological Survey of Canada, Ottawa, Canada, 1991. Return to text. Estes, R. and Hutchison, J.H., Eocene lower vertebrates from Ellesmere Island, Canadian Arctic Archipelago, Palaeogeography, Palaeoclimatology, Palaeoecology 30:225–247, 1980. Return to text. Oard, M.J., Mid and high latitude flora deposited in the Genesis Flood—part II: a creationists hypothesis, CRSQ 32(3):138–141, 1995. Return to text. Austin, S.A., Mount St. Helens and catastrophism; in: Walsh, R.E. (Ed. ), Proceedings of the First International Conference on Creationism, volume I, Creation Science Fellowship, Pittsburgh, PA, pp. 3–9, 1987. Return to text. 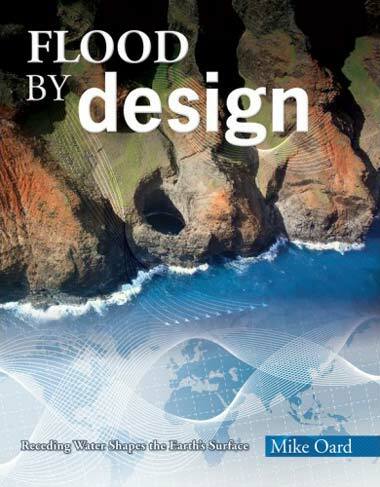 Woodmorappe, J., A diluvian interpretation of ancient cyclic sedimentation; In: Studies in Flood Geology: A Compilation of Research Studies Supporting Creation and the Flood, second edition, Institute for Creation Research, Dallas, TX, pp. 201–220, 1999. Return to text. Markwick, P.J., Fossil crocodilians as indicators of Late Cretaceous and Cenozoic climates: implications for using palaeontological data in reconstructing palaeoclimate, Palaeogeography, Palaeoclimatology, Palaeoecology 137:205–271, 1990. Return to text. Markwick, P.J., ‘Equability,’ continentality, and Tertiary ‘climate’: the crocodilian perspective, Geology 22:613–616, 1994. Return to text. Oard, M.J., Tropical cycad reinforces uniformitarian paleofloristic mystery, JofC 12(3):261–262, 1998. Return to text. Oard, M.J., A uniformitarian paleoenvironmental dilemma at Clarkia, Idaho, USA, JofC 16(1):3–4, 2002. Return to text. Matthews Jr, J.V. and Ovenden, L.E., Late Tertiary plant macrofossils from localities in Arctic/Subarctic North America: a review of the data, Arctic 43:364–392, 1990. Return to text. Oard, M.J., Frozen in Time: the Woolly Mammoth, the Ice Age, and the Biblical Key to Their Secrets, Master Books, Green Forest, AR, 2004. Return to text. Vardiman, L., Sea-Floor Sediment and the Age of the Earth, Institute for Creation Research, Dallas, TX, 1996. Return to text. Vardiman, L., Climates Before and After the Genesis Flood: Numerical Models and Their Implications, Institute for Creation Research, Dallas, TX, 2001. Return to text. Oard, M.J. and Klevberg, P., The Green River Formation very likely did not form in a postdiluvial lake, Answers Research Journal 1:99–108, 2008. Return to text. Sloan, L.C. and Barron, E.J., “Equable” climates during earth history? Geology 18:489–492, 1990. Return to text. Sewall, J.O. and Sloan, L.C., Less ice, less tilt, less chill: the influence of a seasonally ice-free Arctic Ocean and reduced obliquity on early Paleogene climate, Geology 32:477–480, 2004. Return to text. Sloan, L.C., Equable climates during the early Eocene: significance of regional Paleogeography for North America climate, Geology 22:881–884, 1994. Return to text. Sloan, L.C., Huber, M., Crowley, T.J., Sewall, J.O. and Baum, S., Effects of sea surface temperature configuration on model simulations of “equable” climate in the Early Eocene, Palaeogeography, Palaeoclimatology, Palaeoecology 167:321–335, 2001. Return to text. Sloan, L.C. and Morrill, C., Orbital forcing and Eocene continental temperatures, Palaeogeography, Palaeoclimatology, Palaeoecology 144:21–35, 1998. Return to text. Sloan, L.C., Walker, J.C.G. and Moore Jr, T.C., Possible role of ocean heat transport in early Eocene climate, Paleoceanography 10:347–356, 1995. Return to text. Oard, M.J., Climate models fail to produce warm climates of the past, JofC 23(2):11–13, 2009. Return to text. Schrag, D.P., Effects of diagenesis on the isotopic record of late Paleogene tropical sea surface temperatures, Chemical Geology 161:215–224, 1999. Return to text. Pearson, P.N., Ditchfield, P.W., Singano, J., Harcourt-Brown, K.G., Nicholas, C.J., Olsson, P.K., Shackleton, N.J. and Hall, M.A., Warm tropical sea surface temperatures in the Late Cretaceous and Eocene epochs, Nature 413:481–487, 2001. Return to text. Oard, M.J., The ‘cool-tropics paradox’ in Palaeoclimatology, JofC 17(1):6–8, 2003. Return to text. Oard, M.J., Vertical tectonics and the drainage of Floodwater: a model for the middle and late diluvian period—Part II, CRSQ 38(2):79–95, 2001. Return to text. Oard, M. J., Dinosaurs in the Flood: a response, JofC 12(1):69–86, 1998. Return to text. Chaney, R.W., Tertiary forests and continental history, GSA Bulletin 51, pp. 478–479, 1940. Return to text. Bustin, R. M., Beaufort Formation, eastern Axel Heiberg Island, Canadian arctic archipelago, Bulletin of Canadian Petroleum Geology 30:140, 1982. Return to text. Hills, L.V. and Ogilvie, R.T., Picea banksii n. sp. Beaufort Formation (Tertiary), northwestern Banks Island, arctic Canada, Canadian Journal of Botany 48:457–464, 1970. Return to text. Basinger, J.F., The fossil forests of the Buchanan Lake Formation (early Tertiary), Axel Heiberg Island, Canadian arctic archipelago: preliminary floristics and paleoclimate; in: Christie, R.L. and McMillan, N.J. (Eds. ), Tertiary Fossil Forests of the Geodetic Hills, Axel Heiberg Island, Arctic Archipelago, Geological Survey of Canada Bulletin 403, Ottawa, Canada, pp. 62–63, 1991. Return to text. Clutter, T., The Clarkia fossil bowl, American Forests 91(2):22–25, 1985. Return to text. Ager, T.A., White, J.M. and Matthews Jr, J.V. (Eds. ), Tertiary Quaternary Boundaries, Pergamon, Oxford, U.K., 1994. Return to text. Cronin, T.M. and Dowsett, H.J., PRISM—warm climates of the Pliocene, Geotimes 38(11):17–19, 1993. Return to text. Funder, S., Abrahamsen, N., Bennike, O. and Feyling-Hanssen, R.W., Forested Arctic: evidence from North Greenland, Geology 13:542–546, 1985. Return to text. Chaney, ref. 42, p. 471. Return to text. Meyer, H., The Oligocene Lyons flora of northwestern Oregon, The Ore Bin 35(3), pp. 42–43, 1973. Return to text. Chaney, ref. 42, p. 472. Return to text. Bill Hoesch, personal communication. Return to text. Oard, M.J., Jurassic mammals—more surprisingly diverse, JofC 21(2):10–11, 2007. Return to text. Oard, M.J., Dinosaur tracks, eggs, and bonebeds; in: Oard, M.J. and Reed, J.K. (Eds. 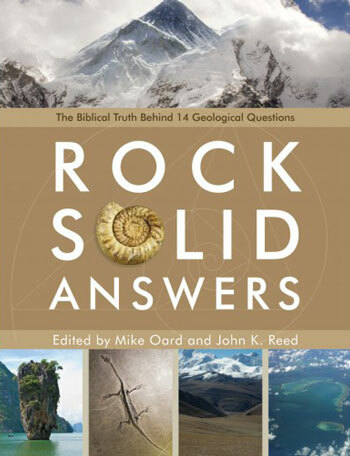 ), Rock Solid Answers: The Biblical Truth Behind 14 Geological Questions, Master Books and Creation Research Society Books, Green Forest, AR, and Chino Valley, AZ, pp. 245–258, 2009. Return to text. 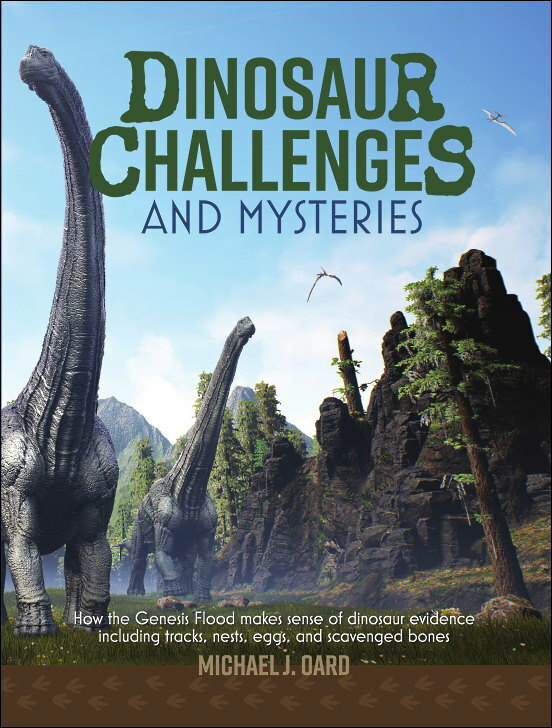 Oard, M.J., Dinosaur Tracks, Eggs, and Bonebeds Explained by the Flood, Creation Book Publishers, Powder Springs, GA (in press). Return to text. Whitcomb Jr, J.C. and Morris, H.M., The Genesis Flood, Baker Book House, Grand Rapids, MI, 1961. Return to text. Anonymous, Ivan whips Cuba with wind, waves, Bozeman Chronicle, September 14, pp. A1, A8, 2004. Return to text. Lockley, M. and Peterson, J., A Guide to the Fossil Footprints of the World, University of Colorado, Denver, CO, 2002. Return to text. Holt, R.D., Evidence for a Late Cainozoic Flood/post-Flood boundary, JofC 10(1):128–167, 1996. Return to text. Lockley, M. and Hunt, A.P., Dinosaur Tracks and other Fossil Footprints of the Western United States, Columbia University Press, New York, NY, 1995. Return to text. Lockley, M. and Meyer, C., Dinosaur Tracks and Other Fossil Footprints of Europe, Columbia University Press, New York, NY, 2000. Return to text. Lugn, A.L., The origin of Daemonelix, Journal of Geology 49:673–696, 1941. Return to text. Martin, L.D. and Bennett, K.K., The burrows of the Miocene beaver Palaeocastor, western Nebraska, USA, Palaeogeography, Palaeoclimatology, Palaeoecology 22:173–193, 1977. Return to text. Walker, T., A Biblical geological model; in: Walsh, R.E. (Ed. ), Proceedings of the Third International Conference on Creationism, technical symposium sessions, Creation Science Fellowship, Pittsburgh, PA, pp. 581–592, 1964. Return to text. Barrick, W.D., Noah’s flood and its geological implications; in: Mortenson, T. and Ury, T.H. (Ed. ), Coming to Grips with Genesis: Biblical Authority and the Age of the Earth, Master Books, Green Forest, AR, pp. 251–281, 2008. Return to text. Barrick, W.D. and Sigler, R., Hebrew and geological analyses of the chronology and parallelism of the Flood: implications for interpretation of the geologic record; in: Ivey Jr, R.L. (Ed. ), Proceedings of the Fifth International Conference on Creationism, technical symposium sessions, Creation Science Fellowship, Pittsburgh, PA, pp. 397–408, 2003. Return to text. Brand, L., Faith, Reason, and Earth History, Andrews University Press, Berrien Springs, MI, 1997. Return to text. Oard, M.J., Are the Ashfall Site sediments and fossils post-Flood? CRSQ 46(2):81–91, 2009. Return to text. Reed, J.K., Klevberg, P. and Froede Jr, C.R., Towards a Diluvial Stratigraphy; in: Reed, J.K. and Oard, M.J. (Eds. 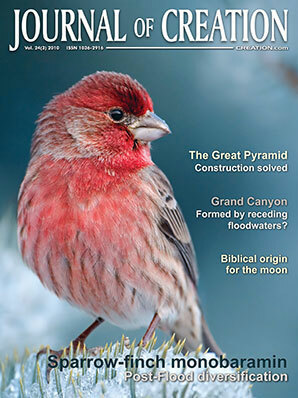 ), The Geologic Column: Perspectives within Diluvial Geology, Creation Research Society Books, Chino Valley, AZ, pp. 31–51, 2006. Return to text. Reed, J.K., Froede Jr, C.R. and Bennett, C.B., A biblical Christian framework for earth history research: part IV the role of geologic energy in interpreting the stratigraphic record, CRSQ 33(2):97–101, 1996. Return to text. Holt, ref. 60, p. 145. Return to text.